This “Action Movie Time Machine” trek will continue with the totally awesome theme of Arnold. So strap ourselves in, light up your cigars and hold onto your butts! The year is 1987. For Broadcasting made it's debut, the Atari 7800 Game System hit store shelves, and the band Aerosmith got a badly needed boost in popularity with the re-release of their song “Walk This Way” featuring Run D.M.C.. The world mourned the loss of Clara Peller – the woman who couldn't help but ask, “Where's the beef?”, and Arnold travels to the future to star on reality television in, “Running Man”. “Running Man” is set in the not too distant dystopian future of 2017 Los Angeles. In this future the economy has collapsed, unemployment has skyrocketed and what's left of the government is frantically trying to maintain order among the civilian population who live in a police state. 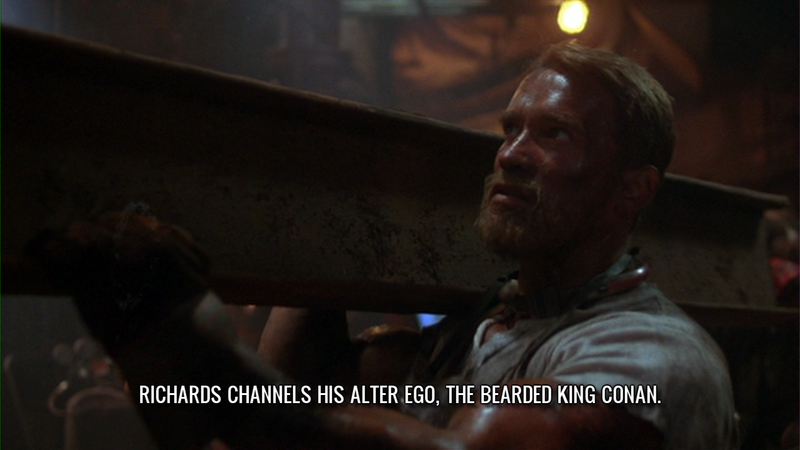 Here we meet Ben Richards, Arnold Schwarzenegger, who is a keeper of the peace. At least, that's what he thought his job was. When dispatched to quell an angry group of food protesters, he received orders to kill them on sight. Richards refused, and as a result his para-military peers killed the protesters and Richards was framed for their murder. This is the future he lives in. Later Richards manages to escape his work camp prison with help from William Laughlin, Yaphet Kotto, and Harold Weisse, Marvin McIntyre. The three escapees meet up with the “underground resistance” -- because when you live in a dystopian future there is always an underground resistance. The resistance helps them each escape the city. Meanwhile, Damon Killian, Richard Dawson, host of the top rates television game show “Running Man”, is made aware of Richards' escape. Familiar with his alleged murderous tendencies, Killian wants Richards, and his prison friends, captured to be used as a contestant on his show. So, what exactly is “Running Man”? This show selects convicted criminals to participate in a gladiatorial adventure in which they must survive in a “Hunger Games” like arena with trained killers who are stalking them. If the contestants survive, their criminal record is erased and they go free. If they are caught by the “Stalkers”, they die. All of which is being broadcast live for the entertainment of the home viewers. The television executives work hand in hand with the Entertainment Division of the Justice Department. The show entertains the masses while making examples of the lawless – encouraging them all to fall in line with the demands of the ever powerful and ruthless government. To avoid protests and civil unrest, there is “Running Man”. This is a shared idea between this film and the 1975 “Roller Ball”. Now we have Richards, with Laughlin and Weisse, traversing the city in their skin tight runner get-ups doing their best to survive. While Richards and Laughlin fight off Stalker attacks, Weisse sets out to learn the up-link codes to the television network's satellites. With the right codes, the resistance can override the network signal and communicate with the “Running Man” audience. With these codes they broadcast the truth about Richards and how he wasn't responsible for the deaths of 1,500 protesters and also how the Killian is a puppeteer – controlling and manipulating information to in turn, control and manipulate his audience. But first, Richards murders the Stalkers and wins over the viewing public as he does it. 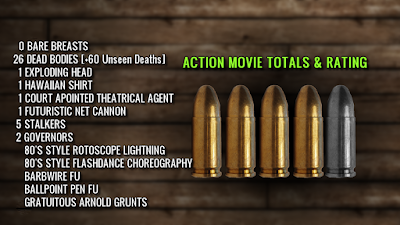 The rest of the film is good, but this is why we watch it. First there is Sub Zero, played by former professional wrestler Professor Toru Tanaka. Sub Zero is a hockey player from hell who wields a bladed hockey stick. As they fight, Richards manages to use his surroundings to his advantage and strangles Sub Zero to death with barbwire. Followed by the one-liner, “Here is Sub Zero... Now...plain zero!”. Then we have Buzzsaw & Dynamo. Buzzsaw, Gus Rethwisch, is a motorcycle riding, chainsaw swinging madman who as a child wanted to grow up and become Leather Face. Richards makes quick work of him as he overpowers Buzzsaw, turning his beloved chainsaw against his crotch – sawing him in half. Later he is asked, “What happened to Buzzsaw?”. To which he replies, “He had to split.”. One-liner gold! Dynamo is an odd duck. He is an overweight opera singer who shoots '80s rotoscope lightning from his hands. Richards traps Dynamo when he tricks him into following him up a hill that is too steep and Dynamo's Go-Kart topples backwards, landing on him. Finally, there is Fireball, Jim Brown – a Stalker with a flamethrower and a jet pack. 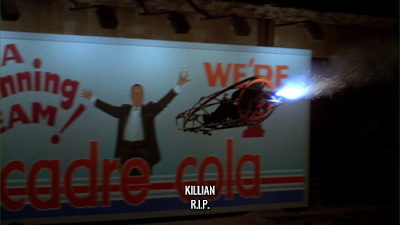 The two get into the ol' fist-a-cuffs and Richards manages to sever Fireball's fuel line – leaking it everywhere. Richard's finishes him off using a flare to light him on fire while asking, “How 'bout a light?”. 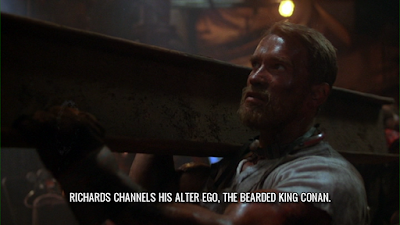 Richards meets up with the underground resistance, who have been watching his progress on television. They use the codes to broadcast the truth and Richards leads them into battle with the network security and government agents. In the end Richards gets even with Killian when he gives the people what eh thinks they want, by launching Killian into a billboard with his own face on it – blowing him up. And in the background chaos erupts as the underground resistance goes aboveground. The End. 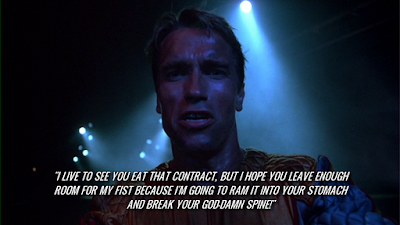 Here we have another quintessential '80s action flick, starring Arnold. It has everything you would want. 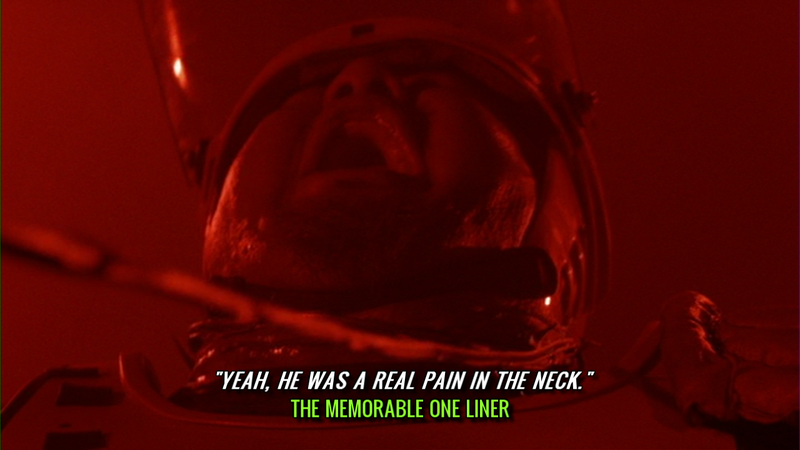 Exotic deaths, a dystopian future and one-liners galore. It also has a really good, while understated, theme that reoccurs thought the film and one of the retired Stalkers is Captain Freedom, played by Jesse Ventura. Yep, “Running Man” has not one, but two Governors. 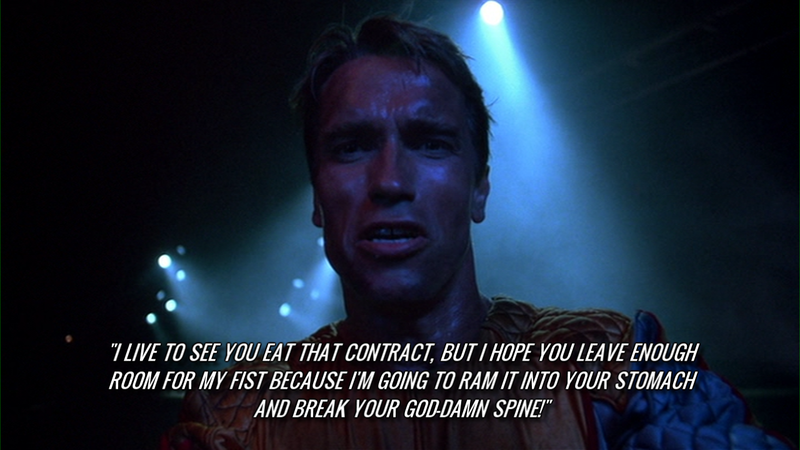 It's right around this time when Arnold started to come into his own. His English was getting good and the films he starred in were getting better too. “Running Man” is similar to another one of Arnold's films, “Total Recall”, in the way that the action is entertaining, but the sci-fi story is what makes it memorable. 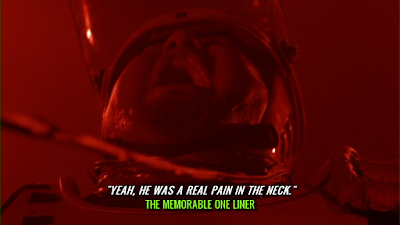 And like “Total Recall” it draws parallels between it's story and real life. “Running Man” predicted reality television, including shows like “The Real World”, “Survivor”, and especially “Fear Factor”. But what's really interesting about the film is the way Killian manipulates the facts to sell his viewers his brand of truth. 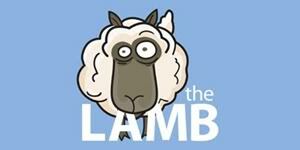 It gets it's viewers to ask themselves, can we truth the news we are fed and the authority that feeds it? This is more important now in the post September 11th/War on Terror era than when it was filmed. But this idea, ”Can we trust the news?”, is a question that can be asked at least once every generation. 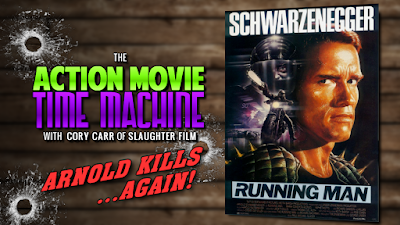 The inspiration for the “Running Man” came from the Richard Bachman book of the same title. Bachman was a pen name used by Stephen King for a while. It's funny to think that he man who wrote “Carrie” and “Stand By Me” is also in some way responsible for this '80s Arnold action flick. In conclusion, if you haven't seen “Running Man”, you are a fool. It's a classic. 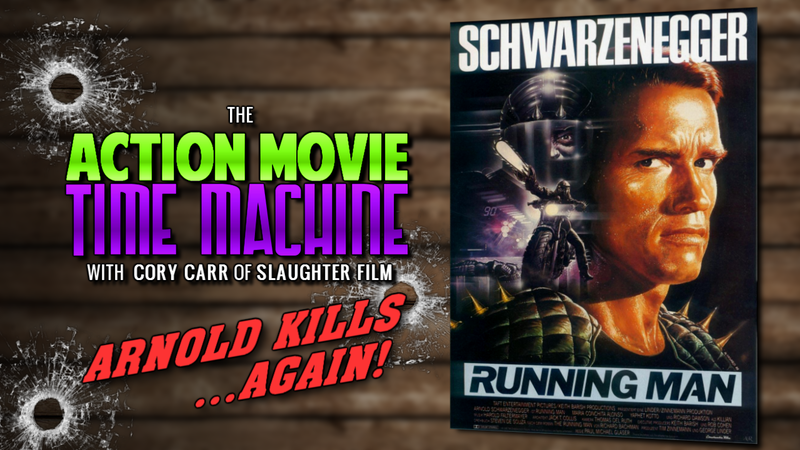 For more action packed “Running Man” goodness, check out the Slaughter Film podcast focused on “Futuristic Gladiator” films. We discussed both “Running Man” and “Roller Ball” starring James Caan. 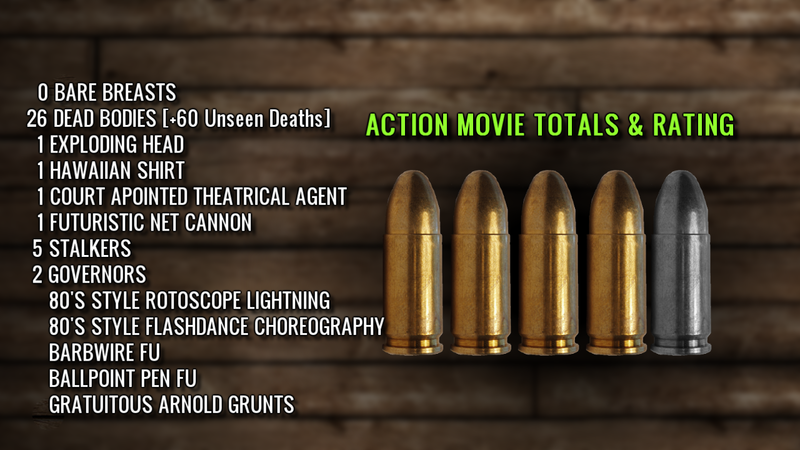 I’m Cory Carr and this concludes another trip in the “Action Movie Time Machine”. Until next time, “I'LL BE BACK!”.